“I honestly think we can do better,” Ditchflower Brian Merrill said in 2007, upon the release of his band’s debut, “Carried Away.” At the time it may have sounded like excessive modesty or an idle boast. After all, how much better could an album get? Grounded in melody, layered with witty, intelligent lyrics, and topped with the sort of harmonies that send pop fans swooning, “Carried Away” won the hearts of fans and critics nationwide, including NPR, which featured a track from the album, “Home Away From Home,” on its “Open Mic” series. Topping “Carried Away” seemed not only unlikely but also unnecessary. But with the Ditchflowers’ second effort, “Bird’s Eye,” Merrill’s prediction turns out to be true. Also, where “Carried Away” was primarily Brian and Ed on everything save for the drums, more friends have since been invited into the fold, making “Bird’s Eye” more of a band effort. 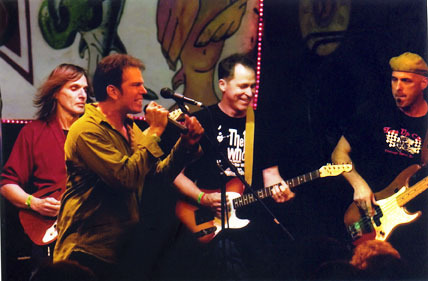 Bassist Michael Hoag and drummer Stan Arthur, both of whom played with Merrill in 1990s power-pop contenders Barely Pink, nail down the beat. Woltil’s old bandmate (Drive Thru Church, The Headlights), Steve Connelly, not only contributes guitar wizardry throughout, but also shares production credit with Merrill and Woltil. Rounding out Ditchflowers v2 is Lee Bryant (Uncle John’s Band, Rich Whiteley Band), who started as a fan and now mans the keyboards. Drummer Bryan Thompson, who briefly replaced Arthur in the lineup at one point, also contributes, as does another of Woltil’s friends, drummer Chuck Darling. The songs, then? Smart, funny, tender but tough…and always taking chances. Check the way “You Could Hurt Someone” moves seamlessly from jaunty pop to soulful breakdown, linked by a jagged, Lennon-esque guitar figure. Or the way the ghosts of the Beach Boys’ star-crossed “Smile” haunt the title track. “Bird’s Eye” is manna from heaven for fans of music with wit, craft and soul. Image-mongers, celebretants and paparazzi-bait need not apply. Brian probably thinks they can do better next time. We can’t wait.